In a world shaken by growing inequality and recurrent economic meltdowns, the case of Spain has gained international attention as a paradigmatic example of the destructive consequences of neoliberal capitalism. At the same time, Spain has also stood out as a leading country in the construction of alternatives to a system based on widespread competition for financial and individual profit. 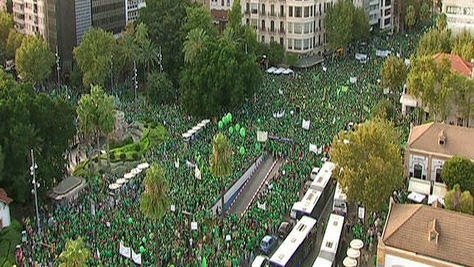 Spain has a long tradition of Mediterranean sociability and political experimentation, which in the last years reappeared through a strong social movement against austerity and neoliberalism: the 15M or Indignados movement, which had a decisive influence on the emergence of the global “Occupy” wave in 2011. The transformative energy of 15M has been partly canalized towards new political parties and electoral platforms such as Podemos, Ahora Madrid, and Barcelona en Común, which stand serious chances of achieving institutional power. Perhaps, however, the spectacular rise to prominence of these platforms has reduced the visibility of the transformations that were already underway. Two fundamental ways of organizing value (cultural and material) are in crisis in Spain: first, the power of so-called ‘experts’; second, neoliberalism as a way of life based on widespread competition. There is a long tradition in every society that tends to establish a group of people ‘in the know,’ and another group ‘in the dark.’ In its ‘modern’ technocratic version it grants legitimacy only to those who participate in certain disciplines and institutions, which give them the title of ‘experts’. In recent years, the economic disaster in Spain has generated such a huge drop in the credibility of political institutions that it has begun to affect this hierarchical cultural system. This has driven many people supposedly ‘in the dark’ to trust in their own abilities to collaboratively construct the knowledge they need in any given situation, and effective answers to the problems that confront them. One of the best examples of this is the Plataforma de Afectados por las Hipotecas, or PAH (People Affected by Mortgages Platform). It would be difficult to dispute that the PAH is one of the institutions most recognized for its legitimacy in Spanish society today. Its legitimacy has not been gained through the authority of ‘experts,’ but earned through the democratic processes of something we could call a ‘culture of anyone.’ The exceptional empowerment that the PAH inspires must be attributed, among other things, to its determined rejection of a ‘service’ model through which housing problems would be confronted with the aid of a series of legal experts, mediators, or activists being offered to an undifferentiated contingent of so-called ‘victims’ whose abilities and ways of knowing would not be relevant. On the contrary, the key to the PAH’s success – as noted by those who began it and maintain it day to day – is that everyone who is affected participates in the process of the struggle for all the cases, with everyone contributing his or her own kinds of knowledge and abilities, and themselves becoming advisers for other affected people. This is not an isolated example. More and more since the occupied squares of 2011, we have seen these ‘cultures of anyone’ arising mostly around grassroots social movements and in collaborative spaces fostered by digital technology, but they are spreading to many other social milieus, including those traditionally reserved for institutional ‘culture’ and ‘politics.’ They tend to promote the idea that the people affected by or involved in a situation should be the ones to participate in changing it, but not from a perspective of ‘anything goes.’ Rather, they promote processes of empowerment and collaborative learning that allow the development of anyone’s abilities and knowledge base. Through this creation of collaborative value, they also confront neoliberalism, which should be understood not only as a set of State or market policies, but also as a widespread way of life that pushes everyone into understanding and living our lives as if they were a competitive business company. As Dardot and Laval have explained, neoliberalism operates on many levels: “For more than thirty years, this rule of existence has dominated public policies, rules global economic relations, and remodeled subjectivity. The circumstances of this normative success have been described frequently, be they the political aspect (the conquest of power by neoliberal forces), the economic aspect (the rise of globalized financial capitalism), the social aspect (individualization of social relations at the expense of collective solidarities, with extreme polarization between rich and poor), or the subjective aspect (appearance of a new subject and development of new psychological pathologies)”. …and how to get out of it? This very omnipresence and monstrosity of neoliberalism has often been used to support the well-known argument of the ‘glass ceiling’ of social movements: movements would have reached the limit of their processing capacity, and it would be necessary to conquer political institutions to go further and stop the feet of the neoliberal attack. However, what the Latin American experience of ‘progressive governments’ (in Argentina, Ecuador, Bolivia, Brazil, etc) shows is that, in reality, it is unclear if it is possible for the State to depart from neoliberalism. The issue is extremely complex. But let me just ask this: is it not true that in some of the institutional platforms that have emerged in the Spanish state to curb neoliberalism there is a very important sensitivity towards the ‘politics from below’? This seems certainly true in Barcelona en Comú, which has worked hard to articulate itself with neighborhood movements—making its own the Zapatista motto of ‘caminar preguntando’— but also in Ahora Madrid and other municipalist platforms. Even with respect to Podemos, despite its drift toward a seemingly more statist populism and its flirtations with a technocratic discourse, I do not think one can say that the experience of collective intelligence and empowering of the 15M cycle is no longer relevant at all. Despite having 6 million people unemployed, 3 million people officially in poverty, 200 daily evictions, constant cuts to basic public services, and corruption scandals at all levels of government, Spain shows no clear signs of structural change over the short term. Though some people refer to political institutions in Spain as “zombie institutions,” since they have lost nearly all of their credibility, they are still in place, dying but not totally dead. 1- First, the imposition of a reality, or of what plays the role of reality, by the everyday stories of the mainstream media. 2- Second, the management of reality by experts who are supposedly the only ones qualified to deal with it. 3- Third, the consumption of reality as a set of possible objects of satisfaction for individuals. I consider the M15 or “indignado” movement to be important less as a form of protest than as a process that is part of a broader transformation–or at least questioning–of those three major cultural mechanisms. I’ll offer some analysis and examples of each of these three mechanisms and their relationship to the Spanish crisis and the M15 movement. Regarding the establishment of reality by the everyday stories of the mass media, it may be useful to start by recalling what happened after the bombings of Atocha station in Madrid in 2004, just days before the Spanish presidential elections. As many of you may know, in the aftermath of the tragic attack that killed 192 people, the government, all well as the Spanish mainstream media, initially attributed the bombings to the Basque pro-independence group ETA. In the international media and informally among the people, however, the hypothesis emerged that the perpetrators were Islamic fundamentalists seeking retaliation for the intervention of the Spanish army in the invasion of Iraq. The second hypothesis, which conflicted with the electoral interests of the governing PP party, ended up being correct, and when the news spread the PP lost the lection. What interests me here is less the identity and motives of the bombers than the fact that the Spanish media systematically attempted to impose a politically expedient but unsupportable version of the events. Even as the evidence mounted against the ETA hypothesis, it took the dissemination of the information from person to person among those on the ground in Madrid, which directly contradicted the media story, to reverse the emerging narrative about the bombing. The use of text messages in cellular phones was crucial in relaying the information as well as in organizing huge impromptu demonstrations in the streets, a clear precedent to the way the mobilizations of M15 were to happen in 2011, 7 years later. Before I go on, a clarification about the establishment of reality by the media. Michel de Certeau explained that to say that the mainstream media establish reality is not to say that people really believe the mainstream media reality. Instead, we think that what the media shows is what most people believe. Of course, this is a circular situation: everyone believes that everyone believes in the media, but no one fully believes in it. This circle is broken when we see other people, questioning, refusing to believe, and proposing alternative versions of reality. The Atocha bombings were one of those moments in Spain. So was the release of the “Cablegate” files by Wikileaks in December of 2010, because they revealed the secret pressure the American embassy in Madrid put on the Spanish government to create a law restricting the use of the Internet, a law that was eventually passed in 2011 as the Ley Sinde, taking the last name of the then Minister of Culture, Ángeles González-Sinde. During the four years it took to propose and pass the law, and increasingly after the Wikileaks revelations, a massive movement in defense of freedom in the Internet arose. At the same time, the Internet itself was becoming a very important sphere of communication in Spain with a certain degree of autonomy from the mainstream. A very interesting episode in the process of this emergence of the Internet as a kind of a counter-sphere to the mainstream media originated with an article called “The dinner of fear”, written by thinker and activist Amador Fernández-Savater. Shortly after the “Cablegate” and in the midst of intense controversy around the law that was going to inherit her name, minister Sinde decided to invite some entertainment industry stars that were openly close to the government to a dinner to discuss the potential internet restrictions. Someone made the mistake of also inviting Fernández-Savater, who had little to do with the people there but was invited perhaps as a critical voice (only one! ), and perhaps because he is the son of a famous philosopher and therefore could add prestige to the occasion. Whatever the case, Fernández-Savater was invited to and attended the dinner, and then told the story in an article that he published on his blog on the next day. He called the event “the dinner of fear” because he considered that fear was the main feeling explaining the position towards the Internet of the minister and the elite of cultural producers around her. Unable to question the traditional concept of intellectual property and individualist notions of cultural production, they regarded digital cultures as theft or piracy, ignoring all the widespread collective sharing and creativity that were already taking place within them. The text went viral. It had hundred of comments, and innumerable re-publications in other websites. If you look at the comments, you can see the indignation with the secrecy and elitism of this powerful group of people discussing matters of public interest but acting more like the leaders of a mafia. This was an important moment in the emergence of a new “them” and “us” in Spanish society. First, it was a separation between those that were afraid of the Internet and those that had found a place for collaboration and autonomy in it. But later, it became something more. After the “dinner of fear” an activist campaign appeared in the Internet with the name of “No les votes” (Do not vote them), which in principle referred to the political parties that had supported the Ley Sinde (including the two big ones), but later shifted to questioning the whole electoral system as an undemocratic institution. 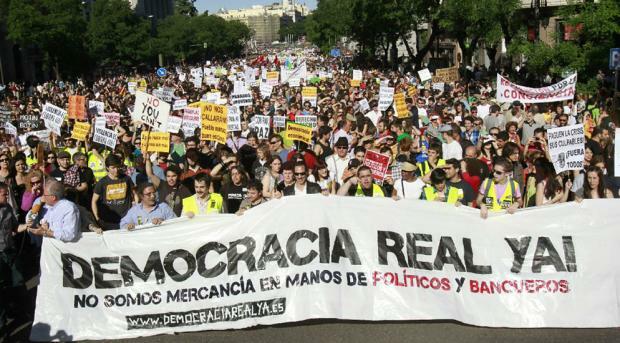 From this campaign and the indignation stemming from an economic crisis provoked by the elites but paid for by the people, there emerged an even bigger Internet campaign, called “Democracia Real Ya!”, which convoked several demonstrations on May 15th of 2011. After the one in Madrid a few people decided to stay in a square, Tahrir style. Over the next few days the most important political movement in Spain since the 70’s began to occupy many other squares, asking for real democracy and stating: “we are not commodities in the hands of politicians and bankers”. The movement didn’t talk about the media in that main slogan, perhaps because it didn’t need to. On the contrary, soon the mass media were the ones trying to get access to the occupied squares, in order to turn them into another story for their establishment of reality. To the surprise of many, reporters were often politely asked to stop their cameras and to join the assemblies and wait for their turn to speak, like everyone else. Of course total autonomy from the mass media and their establishment of reality is far from having been achieved, either during the squares occupation or during the aftermath of M15. But the internet continues to be a place for counter-versions and displacements of the agenda setting of the mass media, though at least two crucial problems (too big to be analyzed here) persist: first, economic dependency of this counter-sphere upon the establishment, in many ways; second, its risk of being captured in the mass media’s establishment of the real by way of a continuous refusal of it. The second cultural mechanism that has been questioned in the context of the movement for Internet freedom and by the M15 and its afterlives is the management of reality by so-called experts who claim to have the exclusive right to define or fix it. In the “dinner of fear” the questioning of the authority of cultural elites was already an important force, but, more than on the Expert in general, that questioning was focused on the figure of the Author, which can be considered a kind of expert. As historian Roger Chartier explained, the figure of the Author was consolidated in the 18th century. The Enlightenment defended the free circulation of ideas among human beings, but the economic interest of publishing houses spread the notion that the results of intellectual work should be considered property of those who created them, as much as the results of manual work. Later the Romantic belief in the uniqueness of individual expression reinforced the figure of the Author. However, in many historical moments and for many social groups, this individualistic and property-based understanding of cultural production has been considered limited and even misleading and abusive. One of these instances of refusal of authorship as individual property is the hacker tradition, which evolved in parallel with the Free Software, Copyleft and Free Culture movements. As Spanish hacker Marga Padilla has explained, the decentralized architecture of the Internet as we know it is the result of the direct and active intervention of the hacker movement in its genesis. Internet promotes and relies on the “intelligence of anyone” because hackers designed it so that all of its nodes are structurally equal, thus promoting an understanding of cultural value as something that is always produced collectively by peers, not by solitary individuals. Social hierarchies and individualist consumerism can colonize the Internet (and they do it all the time), but because of its open and horizontal architecture there is still a democratizing potency in it. This democratic potency was inherited by the M15 movement from the Internet cultures in which it was incubated. In some instances, M15 achieved an incredible capacity for questioning the basic principle that politics and economy should be left to Experts, who deserve all the authority because of their techno-scientific specialized knowledge. It went as far as to question the even more widespread and ancient principle of the inevitable existence of two separate groups in every society: those who know and those who don’t know. Without denying the importance of specialized techno-scientific knowledge, the occupied squares introduced a generalized respect for all kinds of knowledge and human capacities, in a way that broke the illusion of that barrier between the expert and the lay person. The open and collaborative dynamics of the movement, mimicking the hacker and copyleft tradition, encouraged everyone to bring their abilities to a common sphere in which it was assumed that no one knew everything and that everyone could contribute something. Of course it is important to remember that widespread corruption and constant mistakes made by so-called Spanish financial experts and the politicians working closely with them have created an unusual climate of mistrust in the figure of the economist, particularly the techno-scientific Expert so common to the Eurozone in recent years. In the middle of this unprecedented crisis of legitimacy, the M15 movement created a variety of processes of knowledge production and sharing in which specialists worked together with citizens. On one side, there have been a lot of informative actions, including street talks and workshops, Internet campaigns and videos, which have explained the economic situation in terms understandable by anyone. But there have been also processes of grassroots collective political action such as the one promoted by the Platform for a Citizens’ Audit of the Debt, which has already led some municipalities to refuse to pay public debt acquired at high interest rates from banks that have themselves been “rescued” with public money. 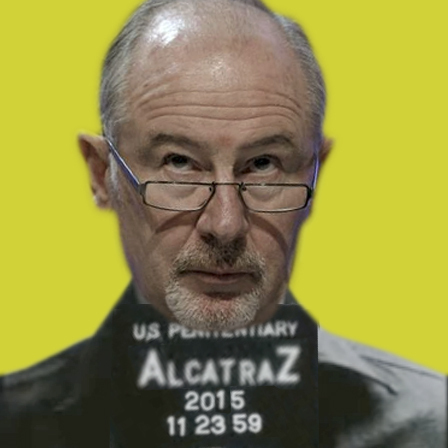 Another interesting process is #QuerellaparaRato (#LawsuitForRato), which has collected information from citizens affected by the wrongdoing of a major banker, Rodrigo Rato, in order to sue him -something that finally has happened and is pending resolution. There are many other examples of processes that have empowered and created space for the knowledge and capabilities of people who are not considered experts, authors or intellectuals in M15. A very significant one is the work of the Acampadasol’s Thinking Working Group. In parallel with the formation of many other working groups during the occupation of Madrid Puerta del Sol square (as for example the Economy, Politics and Culture working groups), several people got together to form the Thinking Working Group because, according to their own account, there was a need for self-representation and self-understanding of what was happening in M15. This Thinking Working Group was not an intellectual avant-garde; it actually defined itself more as a rear-garde group, because it tried to recover and explore the thinking that the movement was already creating on the go. One of their techniques was what they called the “street-thinking” format, which consisted simply in forming a big circle of people in the square and starting conversations about the movement that anyone could join, while the people from the working group took notes of expressions and ideas that they would later analyze and spread. Spain is a country with a strongly elitist tradition of public intellectuals, many of which have become closely tied to the corporate mass media during the last decades. Some of them reacted promptly and aggressively against the practices and discourses of M15, dismissing them as idealistic or simplistic. But others reacted differently. The historian Pablo Sánchez León, a very different type of intellectual, wrote in the blog of the collective history project Contratiempo that M15 was breaking with what he called the “meta-narrative of Spanish modernity”: the assumption that progress and political transformation in Spain can only happen when enlightened minorities guide the uncultivated masses, helping them escape the influence of the traditional right-wing forces. The third and last cultural mechanism that I want to emphasize is the consumption of reality as a set of possible objects of satisfaction for individuals, or what is often just called “consumerism”. This can be understood as one of the effects of what David Harvey, reading Marx, called “the community of money”, which is the organization and concealing of human mutual dependency in societies that use money as the measure of all social wealth. In other words, consumerism is a consequence of substituting markets for community as the main tool for dealing with our constitutive mutual dependency for survival. It is so ingrained in the way people think and act in capitalist societies that it has become naturalized. We think of reality as a set of objects of individual desire, but we live immersed in collective habits and institutions that decide for us which individuals are going to be able to choose what sets of objects of desire. Recently there have been interesting criticisms of digital cultures and of the social and political movements like M15 that have been inspired by them. These criticisms have argued that the fluid and decentralized nature of digital networks is a fertile terrain for the individualistic and ever-renewed experience of consumerism. However, it is important to remember that this decentralized and fluid nature has proven to be a powerful organizing force for collective processes of mutual support, when it translates itself to the material sphere of bodies affected by the violence of neoliberalism. In this sense, I wanted to end by commenting briefly how the two most powerful political experiences in the aftermath of M15, the so-called “Tides in defense of public services” (“mareas”) and the “Platform of People Affected by Mortgages” (“la PAH”) have inherited its fluid and decentralized ways of acting. The two most important “tides” are the “White Tide”, which defends public health, and the “Green Tide”, which defends public education. Breaking with the tradition of top-bottom mobilization that characterizes the major trade unions in Spain, the “tides” have operated through networks of self-organized people, often relying on digital platforms for communication and coordination, and without any political identity other than the defense of human dignity and the right to basic public services. But perhaps what has been even more transformative and empowering in these political processes is the horizontal collaboration between social groups that are usually organized in very hierarchical relations. Thus, we have seen patients, doctors, nurses, and neighbors defending together hospitals in risk of closing by so-called austerity measures; as well as students, professors, and parents defending schools. The tides have major support from the overall population and they have been able to stop some of the cuts to public services. The case of the Platform of People Affected by Mortgages is perhaps even more influential. The Spanish housing bubble was one of the biggest in the world, and since the crisis began in 2008 there have been a growing number of evictions: more than 100.000 last year and an average of 200 per day on the current year. The Plataforma has stopped 802 evictions and has even been able to re-settle 712 people in empty houses, and it has the support of 80% of the population. 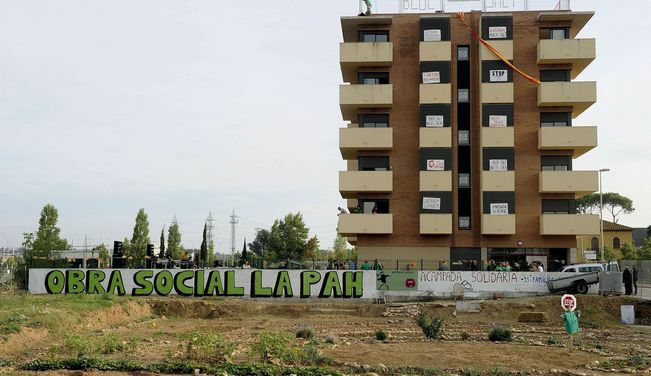 The housing crisis in Spain and the efforts of the Plataforma are becoming international news, as just this week the European Tribunal for Human Rights prohibited the eviction of 16 families from a building occupied by the Plataforma in Catalunya. These political victories have been achieved using a model of decentralized organization. The Plataforma has now 181 different nodes in cities all over the Spanish state, each one with its own autonomy to act. More importantly, what all of this nodes share is a self-organizing model by which those affected by the housing crisis are the ones that help each other, instead of what would happen in a typical model of service or even charity provided by activists, social workers or NGO’s. With this self-organizing model, affected people treat the housing crisis as a collective and political situation, not as a personal problem, as a consumerist subjectivity would urge them to do. To conclude, these are, I think, important examples of processes that show that the confluence of relative autonomy towards the establishment of reality by the media, empowerment against the authoritarian managing of reality by experts, and the creation of equalitarian networks of mutual dependency are able to at least displace the hegemony of consumerism and of the “community of money”. Two of the many questions that remain open are whether these processes can transform themselves into stable institutions and, if they can, whether the current institutions that protect the community of money are going to allow this to happen. Culturas de cualquiera by Luis Moreno-Caballud is licensed under a Creative Commons Attribution-ShareAlike 3.0 Unported License.